On every farm, you are guaranteed to find two things- the farmer, and a hard- working vehicle! We know this, and we work hard to supply everything you need to maintain your truck, as well as all of your other vehicles and farm implements! Whether you need oil, or anti-freeze coolant, or even windshield washer fluid, we have it in stock! We also carry other necessities, such as automotive fuses, light bulbs, and so much more! Stop by today! 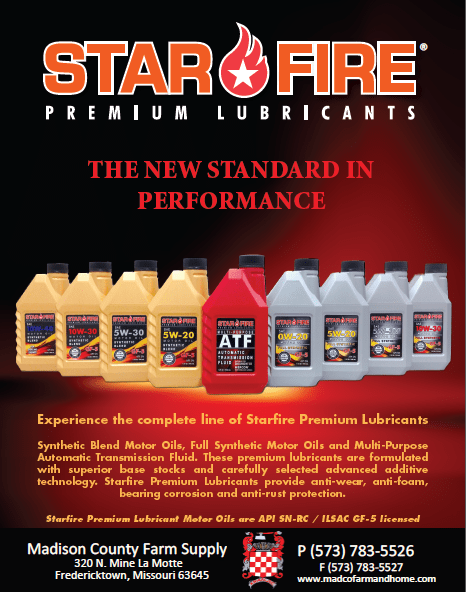 We have also recently started carrying brand new Starfire lubricants, to provide high- quality oils and fluids, at prices that will surely amaze. We now carry their name brand hydraulic oil, synthetic, conventional, and blend oils, as well as other high- demand products! These are all created to strict factory specifications, and are sure to perform well, and out- perform all other competition!